If you are planning to sell alcohol or play music at your event, you may need a temporary licence – contact your local council for details. Maintain parking areas and grounds; spaces may need to be white lined regularly, or if grounds can get muddy, reinforcement could be used to protect the grass and prevent erosion. Use barriers and handrails to define footpaths and ensure pedestrians are kept away from traffic. Don’t forget marshals and stewards need to wear hi-visibility clothing for easy identification. Consider outdoor seating for picnics and rest areas. Provide recycling bins for visitors to dispose of their rubbish and enable easy recycling. 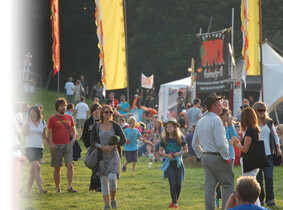 Making the most of summer attractions, hospitality and event management. Rain or shine, when summer comes the UK always hosts a huge range of outdoor events and this year will be no different with everything from corporate events through to a wide range of global sporting competitions taking place, which can all be hugely beneficial to businesses. However, regardless of whether a business is hosting an event or temporarily expanding its product or service offering, it’s vital that it is done properly and creates a show that will be remembered for all the right reasons. Good organisation and creating a great first impression are key to attracting and holding the attention of both visitors and customers alike. This means using clear signage and effective communication methods and having clearly marked systems in place for visitors when they arrive. In some cases, these might need interpreting for international visitors. You may have to expand car parking and create temporary areas for cars, if these areas are on grass, you may need to use reinforcement to protect the ground from erosion. It may also be necessary to think about emergency and evacuation procedures and how visitors will be made aware of these. In certain circumstances, you might need to ask visitors to sign in or keep track of exactly how many people are on the premises – this is important for fire regulations if it is an indoor event. If you are expecting large numbers of visitors, it is often advisable for staff to wear conference badges or high visibility clothing, which makes them easily identifiable. Barriers and cones are also an effective way of creating walkways, guiding people in the right direction and restricting access to certain areas.